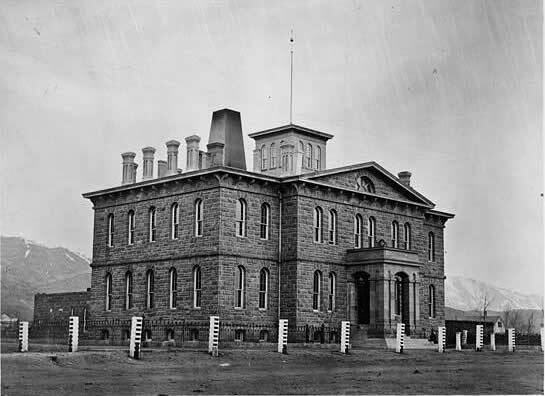 The Carson City Mint was established by Congress on March 3, 1863, to serve the coinage needs brought about by the Comstock Lode, the largest silver strike in the Nation's history. Prior to the development of this facility, silver and gold ore mined in the Nevada territory was shipped to San Francisco for processing. However, the costs of shipping and the risk of theft necessitated a branch in the territory. Groundbreaking ceremonies took place on July 18, 1866. The cornerstone for the new facility was laid on September 18, 1866, but the building was not completed until December 13, 1869. Abraham Curry, founder of Carson City, was appointed by President Ulysses S. Grant as its first superintendent. Curry, known as "The Father of Carson City" also supervised the construction of the mint. In 1870, just six years after Nevada entered the Union as the thirty-sixth state, residents enthusiastically welcomed their new mint. The Carson City Mint, an impressive sandstone structure of the Renaissance Revival period, was designed by architect Alfred B. Mullett the newly-appointed supervising architect for the United States Treasury Department, as well as, the designer of the San Francisco Mint. Curry oversaw production of the first coins ever minted in Carson City. On February 11, 1870, "Seated Liberty dollars" with the "CC" mintmark rolled off the solitary coin press known as (Press No. 1). During its operation, the Carson City Branch issued 57 different types of gold coins and produced eight coin denominations, including dimes, twenty cent pieces, quarters, halves, Trade dollars, Morgan dollars, five dollar gold pieces, ten dollar gold pieces, and twenty dollar gold pieces. In 1873, the Carson City Mint experienced its most eventful year when changes were made to the nation's monetary system, resulting in different varieties of coins being produced. In 1876, the Carson City Mint joined in the nation's celebration of its 100th birthday (which also coincided with peak production levels on Nevada's famous Comstock Lode), as more coins were struck than in any other year in the history of the Carson City Mint. James Crawford served as superintendent of the Carson City Mint for ten years starting in 1874 until his death in 1885. The mint was shut down in 1885 for political reasons and remained closed under a Democratic administration led by President Grover Cleveland from the middle of 1885 until the fall of 1889. In October 1889, coins once again began rolling off the mint's presses and continued to do so until the spring of 1893, at which time coinage operations ceased for good. The Carson City U.S. Mint's formal mint status was withdrawn in 1899 due to the drastic decline in mining on the Comstock. The facility continued to function as an assay office until it closed in 1933. It was sold to the state of Nevada in 1939 for $10,000. Today, it functions as the Nevada State Museum. The Morgan silver dollar was one of the most popular coins struck at the Carson City Mint. Nearly 2.8 million of the Morgan dollars were distributed in seven successive sales between 1972 and 1980 by the General Services Administration (GSA) in Washington, DC.